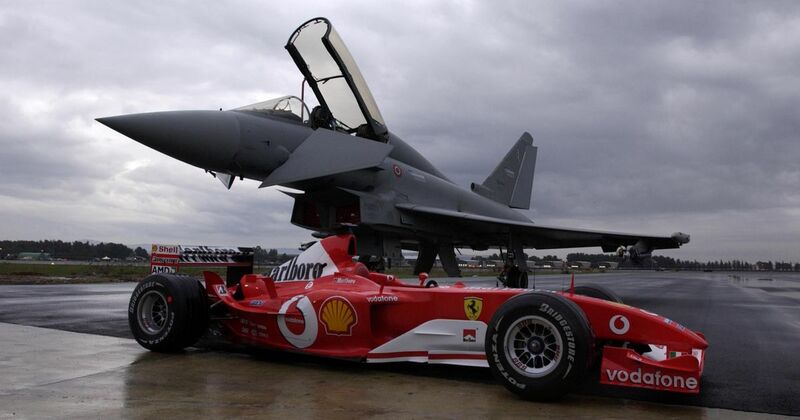 As publicity stunts go, racing an F1 car against a fighter jet is something that will always go down well. In 2003, a race was organised in honour of two anniversaries – the centenary of manned flight, and 50 years since Tazio Nuvolari’s death – a man who also raced against an aeroplane. Michael Schumacher took on a Eurofighter Typhoon with his Ferrari F2003-GA in three drag races over three different distances – 600 metres, 900 metres, and 1200 metres. Despite the wet surface, Schumacher narrowly won over the shorter distance but was trounced over the longer one. In the 900-metre decider the jet claimed absolute victory, winning by two-tenths of a second.